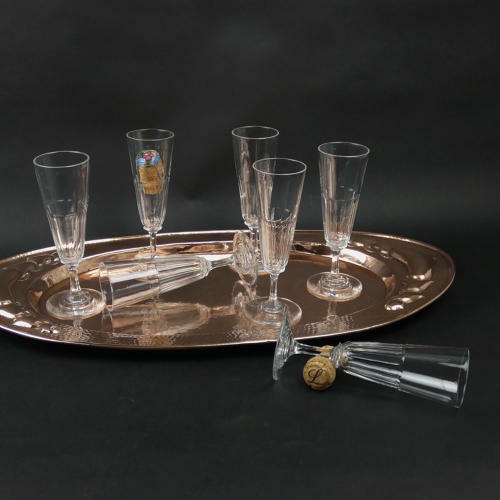 A lovely, quality set of six, crystal champagne flutes. There are actually seven in the image but we have priced as a set of six because one has a small chip at the top of the stem. Six are in excellent condition so we are selling six and giving the seventh free. These are quite a heavy quality crystal but the stems are fine compared to many. They are French and they date from c.1920. Each one has a long, elliptical cut design to the bowl and a facetted stem. They measure approximately 17.3cm. high by 6.5cm. diameter at the foot and 5.5cm. diameter at the rim. The measurement do differ very slightly as they are all hand blown.